Surrounded by small blue collar neighborhood bars and modest homes, Cleveland’s once vibrant industrial flats still offer interesting photo opportunities. 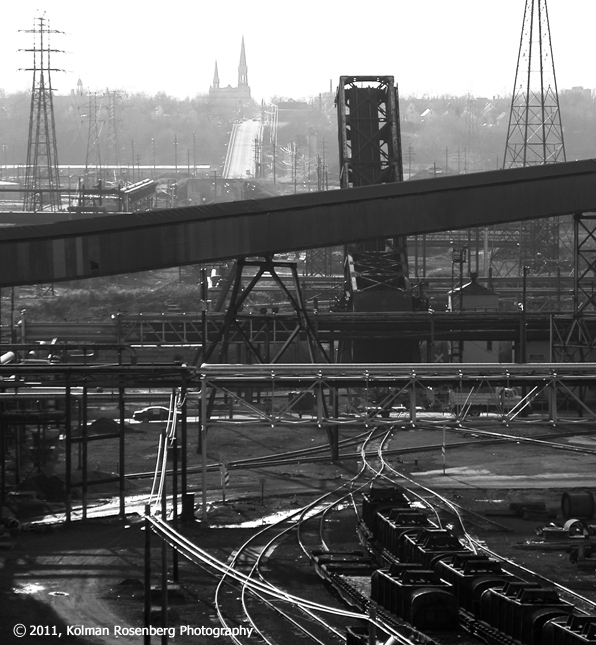 This photo, taken from the end of Pershing Ave., overlooks one of the few remaining steelyards. With wires, tracks, and puddles of water reflecting the sunlight, it’s otherwise a world of black and gray with the west side background rising into the gray haze. This entry was posted in Uncategorized and tagged blue collar, Cleveland, coal, neighborhood, ohio, railroad, slag, steel, steelyard, track. Bookmark the permalink.